Coordonnateurs : Rosenberg Eric D., Nattis Alanna S., Nattis Richard J. 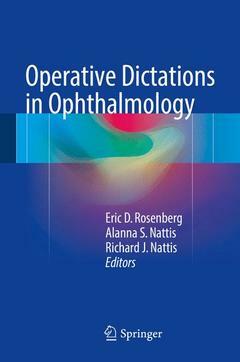 This book provides residents with a comprehensive review of surgical cases within the field of ophthalmology. Operative Dictations in Ophthalmology touches on important steps within each surgical case, indications for the procedure, possible complications, and a sample dictation. The review serves as both a preparation and debriefing for each surgeon, or surgeon in training, by improving comprehension time, cultivating surgical forethought, and refining post operative dictations. Ophthalmology Resident. Department of Ophthalmology, New York Medical College, Valhalla, NY, USA.